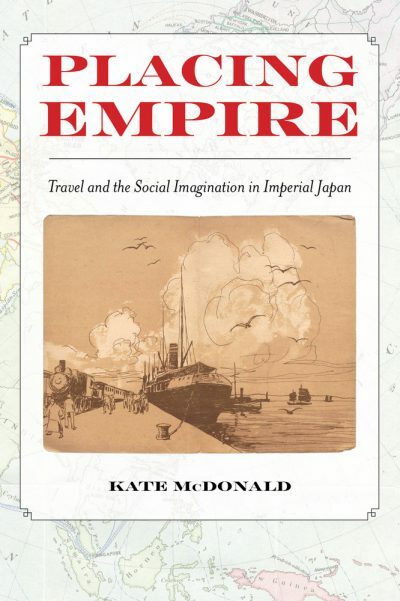 We are happy to announce that Prof. Kate McDonald’s new book, Placing Empire: Travel and the Social Imagination in Imperial Japan is now available in paperback and ebook from UC Press. Placing Empire examines the spatial politics of Japanese imperialism through a study of Japanese travel and tourism to Korea, Manchuria, and Taiwan between the late nineteenth century and the early 1950s. The post-World War I transition from empire as a project of territorial acquisition to empire as a project of territorial maintenance presented a dilemma to colonial empires around the globe: how to maintain colonized lands as places that were both legitimately a part of the nation’s land yet somehow also apart from the nation. McDonald skillfully weaves together a wide-ranging history of the political conflicts that shaped Japanese travelers’ representations and experiences of Korea, Manchuria, and Taiwan to demonstrate how, across the empire, the rise of anti-imperial nationalism and liberal internationalism forced travelers to rethink the relationship between the nation and its land. From a geography of civilization, which imagined that colonized lands would soon be Japanified, to a geography of cultural pluralism, which taught imperial travelers to appreciate the differences between the empire’s diverse cultural regions, the book illuminates how ideas of place played a central role in the production of forms of colonial difference that were suitable to a post-imperial world.